Spectacular and dangerous, they often go hand in hand, something that Los Gigantes became painfully aware of on 1st November 2009 when part of the steep rock face above the beach tumbled down killing two women. 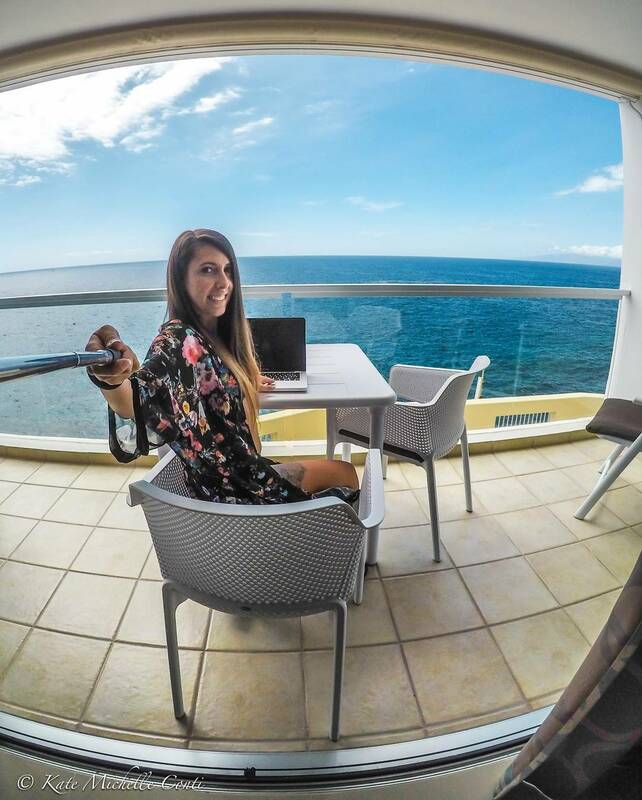 With the legal repercussions dragging on and the beach still sealed off, summer has arrived and whilst the tragedy will not be forgotten, visitors are finding other watery ways to enjoy this west coast Tenerife village. 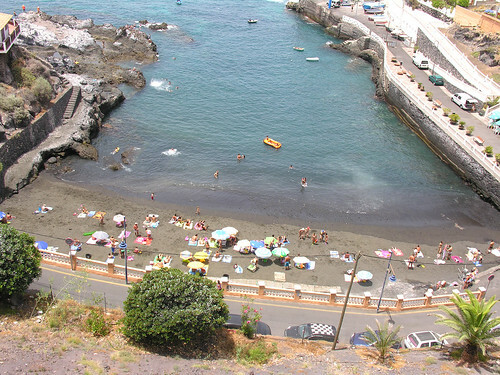 Just across from the beach road is El Laguillo, a winding sea water pool kissed by the sea breeze and with clear views out to the Atlantic as well as the towering cliffs that give Los Gigantes its name as a backdrop. Not artificially heated, the water can be quite cool or refreshing depending on your constitution and at some points the looping circuit narrows, encouraging a friendly exchange of smiles and small talk as you pass another swimmer. It will really put you through your paces if you want to do laps, and opens up into a large shallow end perfect for youngsters just beyond a wooden bridge where many adventures have been acted out. There’s plenty of room to crash out on sun beds and a large restaurant and bar with terrace will tend to your food needs. If you want to converse with nature, they have a rock pool. Entry 3.50 euros, under 8 years FREE. You can stay all day. Week’s pass 20 euros, shade, towel and mattress 2 euros. They have a great offer on this summer, entry and food at the restaurant just 10 euros, that’s a one plate meal and a drink. Pool open from 10.30am to 6.30pm, restaurant food from 9am to 4.30pm but opens from 9am to 6pm for coffee etc. You’re spoilt for choice with outdoor pools. 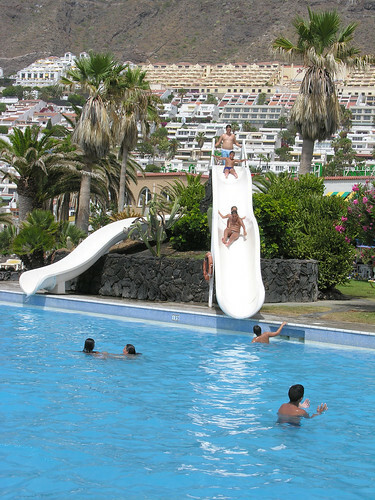 Just above El Laguillo, the Oasis Leisure Centre can be found in Avenida Maritima leading off from the Tourist Information Office. 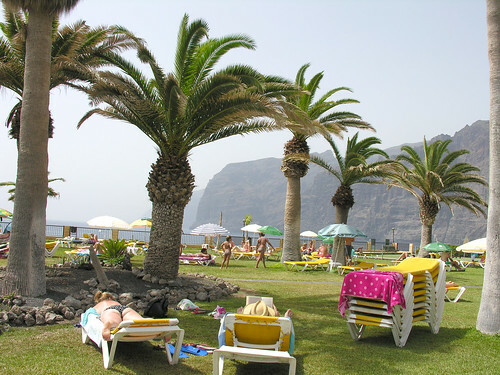 The children’s pool and the main swimming pool come with that inspiring view of the Los Gigantes cliffs and marina, and are set in a sprawling grass and palm tree garden, perfect for sun or shade. The main pool has two slides down into the water and is close to a bar kiosk for cooling your inner self. The main building has a bar and restaurant and of course a terrace. If you want to earn that cooling dip there is a crown bowling area and tennis courts or surfing of the internet variety in the restaurant building. As you are perched up on a rocky ledge you can take advantage of a stone pathway down to the sea level, but be careful. 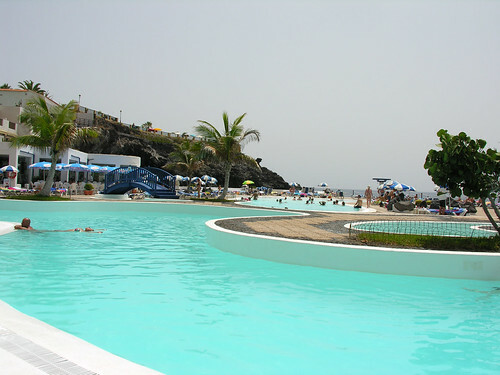 One day with sun bed 4 euros, one week 18 euros, two weeks 33 euros, stay all day. Children up to 11 years pay half price. Shades 1.50 euros. Bowling 19 euros an hour, tennis 10 euros an hour. Of course you still might have a yearning for the open sea. If you take the road out of Los Gigantes, head off to Crab Island at the bottom of Cardiac Hill, you will recognise that as it looms ahead of you. There is a lane sign posted to Crab Island rock pool, a popular but vulnerable bathing spot. In rougher weather the gates are locked, if it is open make sure you are armed with common sense as well as your towel. 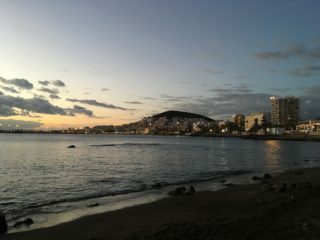 Heading round into Puerto Santiago, turn right down to the Hotel Barcelo and the path to the coastal path. 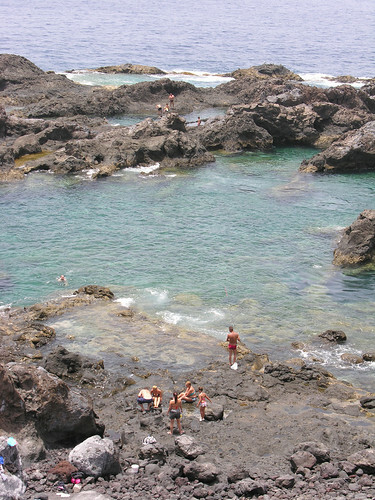 The Paseo Litoral is a lovely walk upgraded and opened in October 2006 and the myriad of rock pools below are another popular spot with locals. The council thoughtfully put in new sturdy stone stairs down to the shore but the warning signs are not there just for fun. For those of us not able to do an impression of a mountain goat, there are some delightful café bars looking down on the bathing area at the new Mar Blanco complex. Sand you say? Well keep following the coastal path and as you round the point you will see the Puerto Santiago beach of dark compacted sand. It’s small but has a nice character, the tiny church and lifeboat shed rub shoulders with a couple of basic Canarian bars, cheap and cheerful and nestled in the deep palm of the beach. Unless you retrace your steps, it’s a steep walk up to the main road. Just be glad you aren’t wheeling the Virgin statue up from the beach after the yearly blessing. Well I saved the best till last. 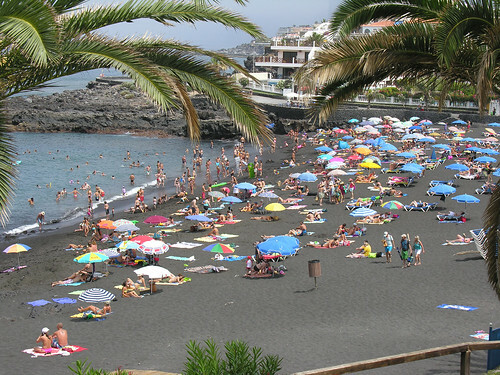 Playa de la Arena is just another 5 minutes walk from Puerto Santiago and a short taxi ride or energetic 20 minute walk from Los Gigantes. The sand here is loose and plentiful and very black, it certainly holds in the heat. It’s a decent sized beach served by a sometimes lively tide but has some of the best amenities on the west coast. The Neptuno and Pancho restaurants are a few steps from the sand and there is even FREE Wi-Fi access on the beach from 10am to 5pm in winter and to 6pm in summer. There is a definite sense of pride attached to this sun trap, adapted buggies offer sea dips for the disabled, and there is the most thorough information board I’ve seen at any beach. Sea and sand temperatures, tide times, wind strength and direction are all here. They even have a questionnaire in three languages to make sure you are happy with what’s on offer. No wonder the European Union Blue Flag is a permanent fixture here. 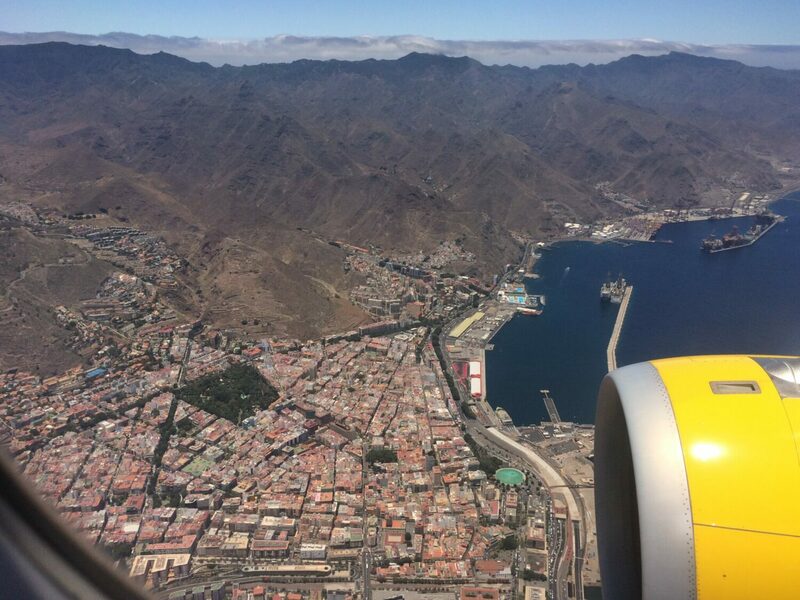 The tranquillity and beauty of Los Gigantes is still well worth seeing and the bustling marina and old church plaza are still focal points for tilting a coffee cup and easing into the laid back life. The sun seekers and water babies might have to find new places to splash around but they don’t have to look far.